Jesus invites you to spend Holy Time with Him during Daily Eucharistic Adoration in Our Lady’s Oratory here at Saint Catherine Laboure Parish. 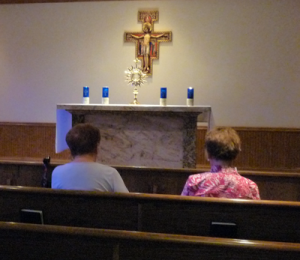 You are welcomed and encouraged to come at any time for prayer and adoration during the regular schedule. But to be certain our Eucharistic Lord is never left alone, we are striving for 4 regular adorers during each of the hours of Exposition. Are you willing to make the commitment? Are you brave enough to say yes to Jesus’ call? Monday through Thursday: 12:00 p.m. to 9:00 p.m. Closings: The chapel with be closed on all federal holidays, December 24th and 31st, 40 Hours, and Good Friday. There will be early closings on Holy Thursday evening, the Parish Mission, and Parish Penance Services. You will be notified if there are any special listings. The chapel follows follows the schedule of Central Dauphin School District for closings and cancellations due to inclement weather.